Realize Band Surgery – Are You A Candidate? Cost, Recovery, etc. The Realize Band is a brand of adjustable gastric bands used for weight loss surgery. Developed in Sweden in the 1980s, this band was originally known as the Swedish Band. In 2007, the device was renamed and received approval from the FDA for use in surgeries performed in the United States. It works in a similar manner at the Lap-Band system. Known as a restrictive form of bariatric surgery, the band is placed around the stomach to limit the amount of food that can be consumed after surgery. The requirements for the Realize Band are about the same as for other types of bariatric surgery. Most candidates are adults with a body mass index, or BMI, of 40 or higher. This is the equivalent of being at least 80-100 pounds overweight. The Realize Band may also be used on patients who are obese (defined as a BMI of at least 30) with serious health complications stemming from their excess weight. There is no upper weight limit; adjustable gastric bands are a popular choice for patients who are not healthy enough to undergo more invasive weight loss surgeries, such as gastric bypass. Those who cannot undergo this procedure include people who are pregnant or who have ulcers or other conditions indicating inflammation of the digestive tract. Patients undergoing weight loss surgery have usually struggled with their weight throughout their life and tried dieting and exercise but have not had success. Patients opting for gastric banding surgery must be committed to making the necessary lifestyle changes following surgery. The entire procedure takes about one to two hours and is performed with general anesthesia. Some patients return home the same day, while others spend one or two nights in the hospital. 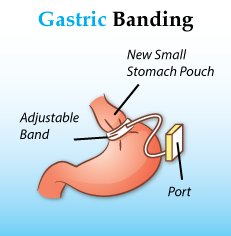 Adjustable gastric banding is usually performed laparoscopically using a camera and small surgical tools. This requires only short incisions of about an inch as opposed to one lengthy incision. The Realize band is made of strong yet flexible silicone. During surgery, it is placed around the upper portion of the stomach creating a narrow passage through which food must pass. This slows digestion and causes a feeling of fullness when a small portion of food has been consumed. The band is connected through a narrow tube to a port in the abdominal wall. This port, under the skin of the abdomen, is used to inject saline into the band. These periodic injections, usually performed several times in the year following surgery, allow the surgeon to adjust the tightness of the band which affects how much food the patient is able to eat. The risks and complications of this procedure include bleeding, infection, negative reactions to anesthesia, and stomach pain. Although rare, there is a risk of death (about 2 in 10,000) which must be considered before making the decision to undergo surgery. Following surgery, there is a risk of erosion of the band into the interior of the stomach or deflation of the band due to leakage of the saline solution. Overeating after surgery may cause nausea, vomiting, or other gastrointestinal symptoms, along with slippage of the band. After surgery, patients are restricted to a liquid-only diet for the first two weeks, followed by a soft food diet for an additional two weeks before they are able to transition to a diet of solid foods. During this time, patients are advised to avoid bending at the waist or heavy lifting which can injure the abdomen and prolong recovery. Most patients return to work within two to three weeks depending on the nature of their job. About six weeks after surgery, a follow-up visit will be schedule for the first ‘fill’ of saline to adjust the tightness of the band. This is done in the doctor’s office and is painless. DID YOU HAVE REALIZE BAND SURGERY? Patients who undergo gastric banding with the Realize Band usually lose about five to ten pounds per week depending on their adherence to a diet and exercise plan. This surgery requires permanent lifestyle changes including eating smaller, healthier meals and chewing foods thoroughly to avoid blocking the narrow channel in the stomach. The cost of Realize Band surgery is about $16,000 to $25,000, depending on the surgeon chosen, the hospital fees, and other factors. Your insurance company may cover all or part of the procedure. Insurance is more likely to cover weight loss surgery if the patient’s excess weight has contributed to health complications such as diabetes or heart disease. If you are considering Realize Band surgery, check with your health insurance plan to learn about their requirements for coverage. If you must pay out of pocket for all or part of the procedure, discuss financing options and payment plans with your surgeon.